I love the Wanderers' song about Mosquitoes. We have midges here which are very very small but there are lots of them! The mountains look amazing and they are much higher than ours. Our biggest mountain is Ben Nevis which is 4,408ft high. I am looking forward to the rest of your week. Thanks to Rakshith from Bangalore, India (18 seconds!) for sending in his lunch. I love fish balls. I like scampi if we eat out but a lot of places only offer you chicken nuggets on the children's menus. Your salad looks the same as mine but your fruit is so colourful! 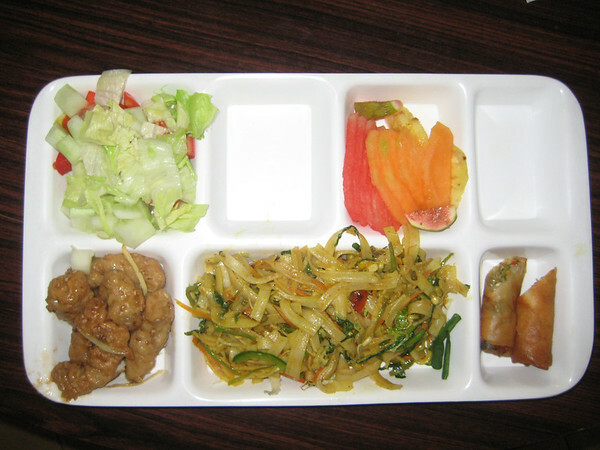 Fish nuggets kinda thing, springrolls, melon,figs and the lettuce infested broccoli salad and pasta stuff, this bit was served today at Canadian international school located at Bangalore, India for lunch. cheers!